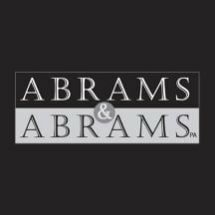 Abrams & Abrams, P.A. is a law firm that focuses on civil litigation involving catastrophically injured persons, wrongful death, truck wrecks, industrial explosions, products liability, business torts, class actions, or environmental torts. At present, Doug Abrams and Margaret Abrams are working as counsel in cases seeking remediation of the North Carolina river system as a result of contamination by corporate hog factories, class actions against Aventis for Starlink Corn and the intrusion of genetically modified corn into the corn supply and some foods, serious injuries from truck wrecks, severe injuries from Firestone tire failure, occupant restraint failures in vehicles, environmental contamination, and cases involving unfair and deceptive trade practices. Doug Abrams and Margaret Abrams founded the firm. Abrams & Abrams, P.A. is based on the principle that each person has a responsibility to our society to fight for a more just society. In these cases we seek to provide our clients with the benefit of our twenty-two years of experience in handling serious personal injury cases and other complex litigation. We realize the importance of dedication, integrity and determination in advancing our clients' causes. Doug Abrams and Margaret Abrams encourage you to review our reported cases. The link for reported cases is found below.